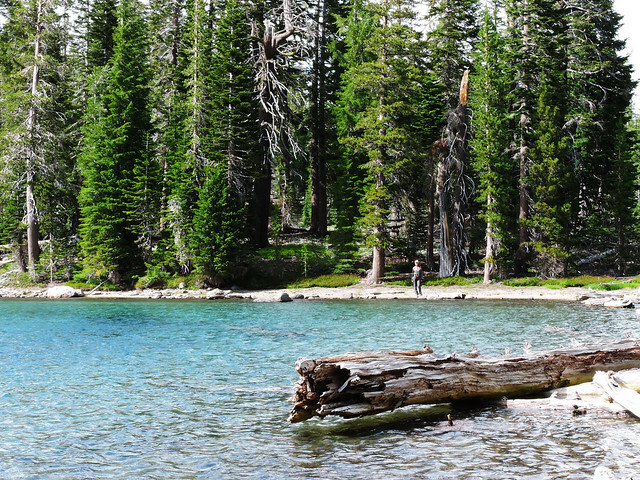 Lassen Volcanic National Park was one of those ones that were not on our bucket list. We simply didn’t know about it previously. We already lived in California for a couple of months when we realized that hey, California not only has redwoods, beaches, deserts and Yosemite, it also has volcanoes! That’s how Lassen Volcanic has became the first volcanic park we’ve visited. And it was a beautiful, memorable visit! Actually, two visits. Because one was not enough. 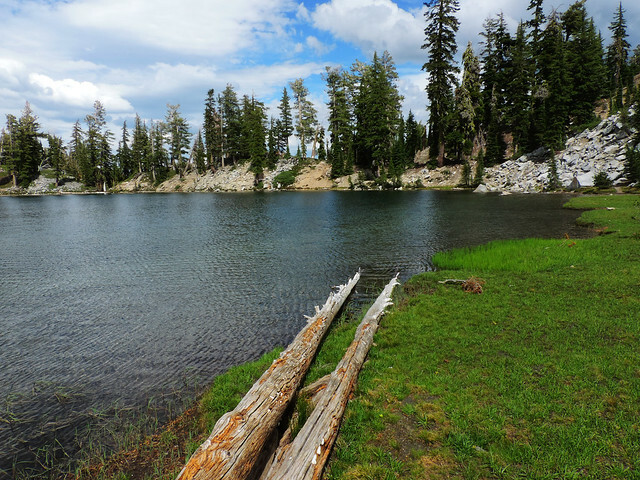 It’s not a huge park (by US standards 😀 ), but in addition to its central area (Lassen Peak, Bumpass Hell, Manzanita Lake) there’s several more remote areas, too, which are definitely worth to be explored. 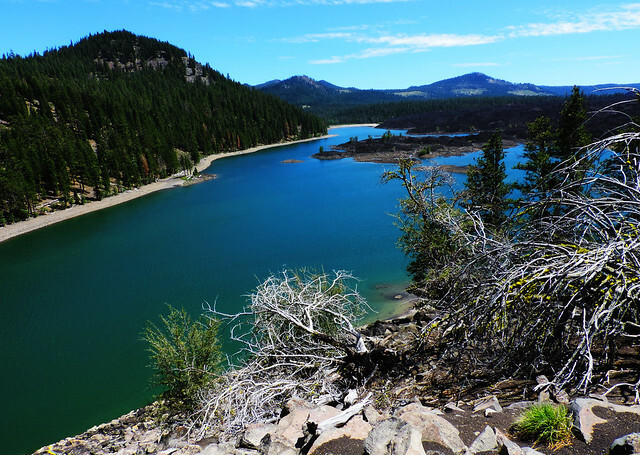 Our favorite is Butte Lake area – because of the hike to Cinder Cone! Hiking to the top of Cinder Cone is the most unique and memorable hike we’ve done in Lassen Volcanic! Actually, it’s among our favorite hikes in the whole US. Cinder Cone looks exactly how we imagine a volcano and if that wouldn’t have been enough we could also hike down to the bottom of its crater. Of course, to get to the crater we had to hike to the top first. And that rewarded us with thrilling views of a very special landscape formed by ash and lava: the Painted Dunes and the dark black lava beds. Several lakes and even Lassen Peak could also be seen from the top. It’s a special, tiring, dirty and beautiful adventure! This fabulous and easy hike around perfectly blue Butte Lake is our favorite lake hike in the park. The trail runs along the lakeshore under the trees and the views of the lava beds and Cinder Cone make it even more special. Hiking Cinder Cone and then chilling out at Butte Lake makes for a perfect day in our opinion. Hiking to the top of Brokeoff Mountain is probably the toughest hike we’ve done in Lassen Volcanic but it rewarded us with stunning views all the way! This trail led us through open meadows first and they were abundant with wildflower at the end of June. Then we continued on rockier terrain with the views of the surrounding peaks – even Mount Shasta covered in snow in the distance. We also found some snow at the top which shouldn’t be surprising as the snow free season here lasts only from July to August. The panorama at the top really rocks and it offers a great view of the old Brokeoff Volcano caldera. 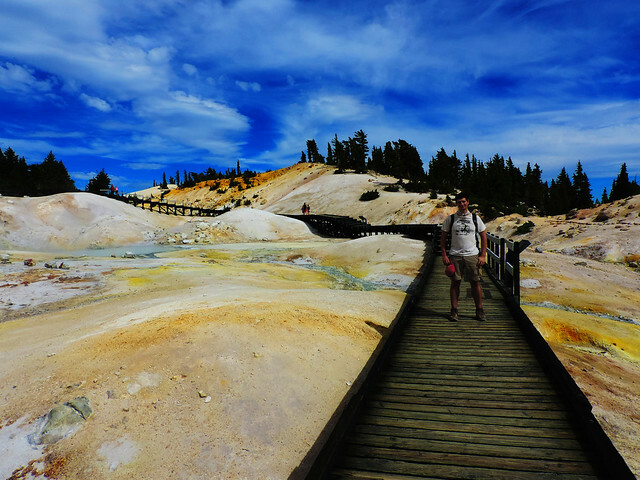 Bumpass Hell is the largest and most interesting hydrothermal area in Lassen Volcanic. With its hot springs, steaming fumaroles and boiling mud pots it’s a living book to learn about volcanic activity! We could access it safely on a boardwalk and it’s forbidden and very dangerous to leave the trail and walk elsewhere in hydrothermal areas. You don’t want to accidentally find yourself in a hot spring with a temperature of 150+ °C, right? Surprise, this easy and nice hike through the forest led us to a boiling lake! The landscape suddenly changes when you reach the lake: the ground there is vivid red, the lake itself is green and there’s several mud pots around it. The temperature of the water reaches 125 °C. It is boiling. The trailhead for Devil’s Kitchen starts at the same place as Boiling Springs Lake Trail. Once you are already there it’s worth exploring this place called Devil’s Kitchen. The trail leads to a hydrothermal area through the forest and it’s a 4.2 miles round-trip. Its steaming fumaroles and boiling mud pots are quite cool. Though it can’t compete with Bumpass Hell that is much bigger and we found it more fascinating, Devil’s Kitchen is less crowded. Plus, it’s super close to Boiling Springs Lake which is definitely not true for Bumpass Hell. 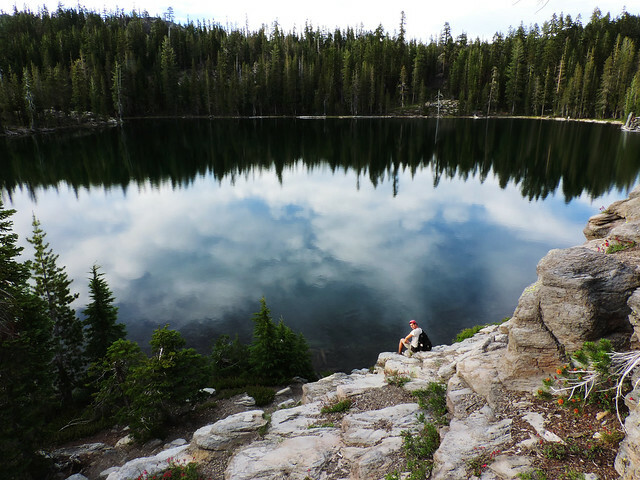 This trail in the central area of the park is the photographer’s dream: three crystal clear lakes with contrasting colors one after the other! Though we have to admit we’ve seen only two of them as fellow hikers told us that the third lake is dried out. So we decided to chill out at Shadow Lake instead of doing the final part of the hike. I don’t think anyone can blame us. Finally, this easy loop around Manzanita Lake is rather a walk than a hike. 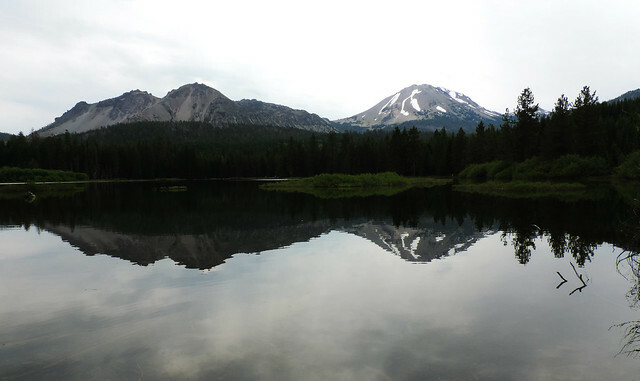 But it rewards with views of Lassen Peak reflecting in the lake if the weather is calm. Plus, some playful squirrels and ducks for your entertainment. There’s one and only lodge (Drakesbed Guest Ranch) and several campgrounds in the park. This lodge is expensive and busy, as you can expect, so you better book it well in advance, or search something in the nearby towns. We are not the passionate camper kind of people, we prefer having a cosy bed and a bathroom, so we ended up staying in inns which are closest to the area we planned to visit. Red Bluff or Redding can be an option if you visit the west side of the park. Chester or Susanville are options for the east side. Of course, expect to drive about an hour to the park and back from these towns. Still it was worth for us as we could book cancellable rooms for reasonable price. On the other hand, it takes time to go from one place to another in the park anyway. 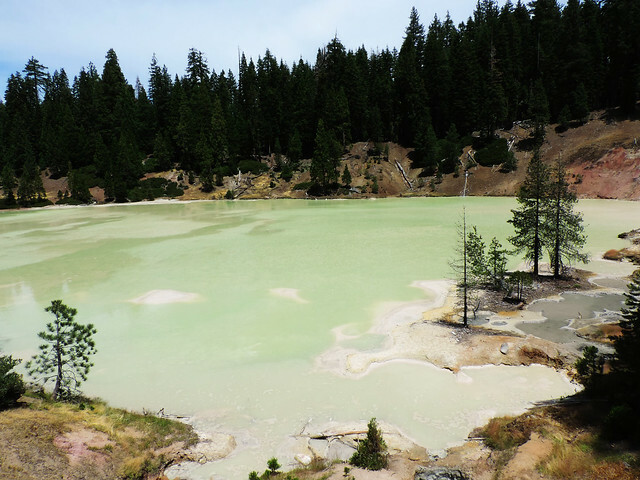 Have you been to Lassen Volcanic? Which of these hikes seems the most exciting to you?